This video was created with ArcGIS Pro 2.0. 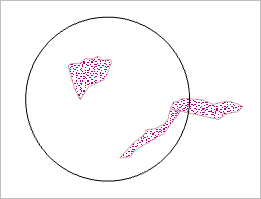 In this tutorial, you'll use geoprocessing tools to solve a spatial problem. Geoprocessing tools are essential for spatial analysis although they have other uses as well. Spatial analysis includes activities like comparing places, determining how places are related, finding best locations and paths, detecting patterns, and making predictions. Most geoprocessing tools work on an input dataset to create a new output dataset. Some tools modify the attributes or geometry of an input dataset. A few tools have other effects, such as creating selections on layers or generating messages or reports. The tutorial steps in the online help reflect the look and capabilities of the current software release. If you have an earlier software version, use the offline help system to open the tutorial. To switch from the online to the offline help system, see Set the help source in the topic About ArcGIS Pro Help. If you don't have ArcGIS Pro or ArcGIS Online, you can sign up for an ArcGIS free trial. Nassella tussock is an invasive weed accidentally brought to New Zealand in the late 1800s. It is now well-established in the Marlborough and Canterbury regions on the South Island. 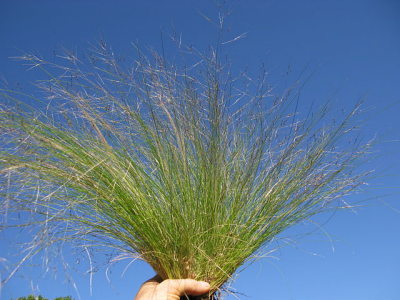 It spreads quickly, crowds out other grasses, and is hard to eradicate. It is unpalatable to livestock, which makes it a threat to pastoral farming. Nassella tussock seeds are spread mainly by wind, but also by animals, people, and vehicles. Nassella tussock. Image by Harry Rose, South West Rocks, Australia. Downloaded from Wikimedia Commons and used under the Creative Commons 2.0 license. In this tutorial, you'll look for Nassella tussock growing near commercial campgrounds (campgrounds for motorhomes). Campers who come in contact with the weed during recreational activities may get seeds in their clothing or gear and take these seeds with them when they leave. If your analysis shows that Nassella tussock grows near commercial campgrounds, agriculture officials can provide information to help campers identify and avoid it. The analysis has three parts. First, you'll create buffers, or proximity zones, around the commercial campgrounds. Next, you'll see which of these buffers contain Nassella tussock. Finally, you'll calculate the amount of Nassella tussock within the buffers. Start ArcGIS Pro and sign in if necessary. On the start page, under your recent projects, click Open another project. If you already have a project open, click the Project tab on the ribbon. In the list of menu items on the left, click Open. On the Open page, click Portal and click Open another project at the bottom of the page. On the Open Project dialog box, under Portal , click All Portal . At the top of the dialog box, in the Search box, type Use geoprocessing tools tutorial and press Enter. In the list of search results, click Use geoprocessing tools to select the project package. If there is more than one project package with this name, look at the Owner column. Select the item with the owner name ArcGISProTutorials. If you don't get any search results, see Access the quick-start tutorials. 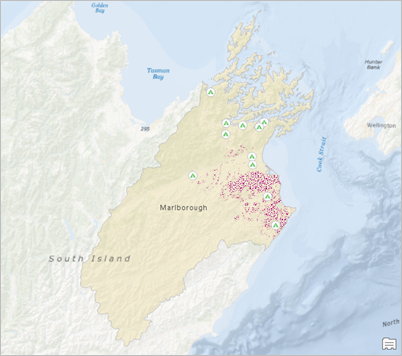 The project opens to the Marlborough region of New Zealand. Commercial campgrounds are displayed along with the known distribution of Nassella tussock. The Nassella Tussock Range layer does not represent the density of the plant at a given location. A marked area may be heavily infested or it may have only scattered plants. The project is stored in your <user documents>\ArcGIS\Packages folder. To carry out the analysis, you'll run tools from the Geoprocessing pane. 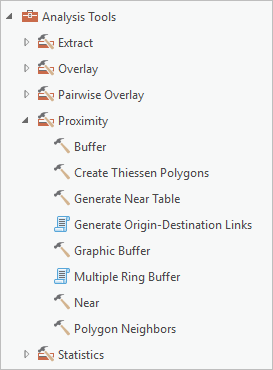 First, you'll see how these tools are organized in ArcGIS Pro. On the ribbon, click the Analysis tab. In the Geoprocessing group, click Tools . The Geoprocessing pane appears. On the Favorites tab, some common geoprocessing tools, including Buffer, are readily accessible. You see a list of toolboxes organized by category. Browse to Analysis Tools > Proximity. A toolbox may contain built-in tools , script tools , or model tools . It may also contain toolsets , which are smaller containers of tools. See Geoprocessing vocabulary to learn more about tool types. The Proximity toolset contains tools for analyzing distances between and around features. In the Proximity toolset, click Buffer. 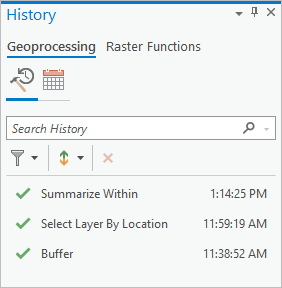 The Buffer tool opens in the Geoprocessing pane. Some of its parameters are blank; others have default values. Required parameters are marked with a red asterisk. Hover over the Help button . A ScreenTip describes and illustrates the tool. The Buffer tool creates distance zones around features. Buffers are typically used to find features in one layer near features in another layer. In this case, you will look for Nassella tussock near campgrounds. Now you'll set the parameters and run the tool. On the Buffer tool, click the Input Features drop-down list and click Commercial Campgrounds. If you have an ArcGIS Pro Advanced license, you may notice that the Side Type and End Type parameters are removed when you set the input features. These parameters are not used with point feature buffers. If you have an ArcGIS Pro Basic or Standard license, these parameters are not available and you won't see them at all. See ArcGIS Desktop license levels for general information about license level differences. Change the default Output Feature Class name to Campground_Buffers. When you hover over the Output Feature Class parameter, the full path to the project geodatabase is displayed. You can either highlight and replace the dataset name at the end of the path or delete the entire path and type the new feature class name. The full path will be restored automatically when the tool is run. Geodatabase dataset names cannot include spaces. Use the underscore character to separate words. In the Distance [value or field] box, type 1.5. Click the adjacent drop-down list of distance units and click Kilometers. 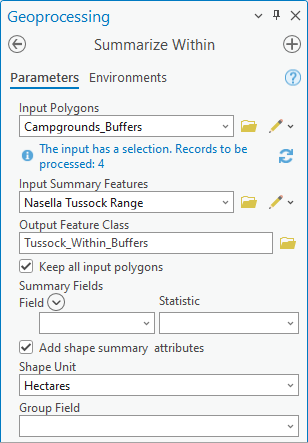 The tool will create a new polygon feature class containing fourteen buffer features: one for each campground. The buffer features will be circles of a 1.5-kilometer radius centered on the campgrounds. Your assumption is that campers are most likely to come in contact with Nassella tussock on walks and bike rides. Hover over any tool parameter, such as Method or Dissolve Type. An information icon appears next to the parameter. When you hover over the information icon, it displays a description of the parameter and its settings. You'll accept the default values for the Method and Dissolve Type parameters. At the bottom of the Geoprocessing pane, click Run . When the tool successfully finishes running, a green check mark appears next to the tool name at the bottom of the Geoprocessing pane. 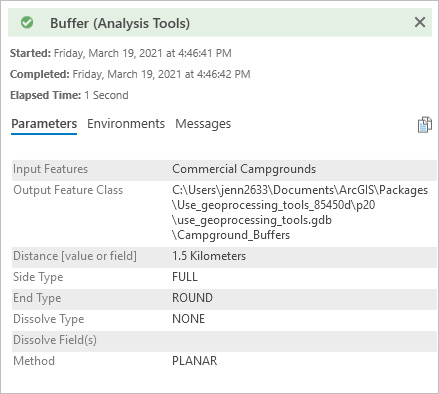 A new feature class named Campground_Buffers is created in your project geodatabase, and a layer is added to the map. At the current map scale, the buffers are probably obscured by the campground symbols. In the Geoprocessing pane, a warning icon appears next to the Output Feature Class parameter. This means that the feature class name has now been used. If you run the tool again without changing the name, you will overwrite existing data. In the Contents pane, turn off the Commercial Campgrounds layer. Right-click the Campground_Buffers layer and click Zoom To Layer . To see Nassella tussock inside the buffers, it will help to change the symbology of the Campground_Buffers layer. In the Contents pane, click the symbol for the Campground_Buffers layer. Your symbol color may be different. The Symbology pane appears, displaying formatting options for the polygon symbol. At the top of the Symbology pane, click the Gallery tab if necessary. In the search box, type outline and press Enter. 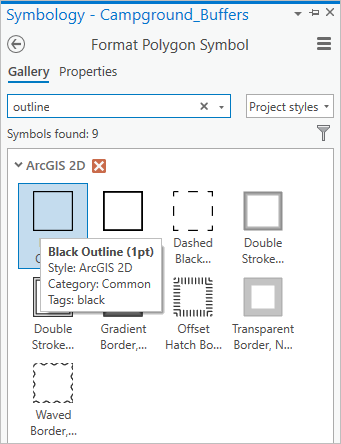 In the ArcGIS 2D style, a few symbols are found. You can hover over the symbols to get more information. Click the Black Outline (1pt) symbol to select it. The symbols are updated on the map. In the Contents pane, right-click the Campground_Buffers layer and click Attribute Table . In the Campground_Buffers table, the name and address attributes have been copied from the Commercial Campgrounds layer that was the input to the Buffer tool. The BUFF_DIST field shows the buffer distance expressed in meters. Zoom in and examine some buffers to see whether they contain Nassella tussock. When you're finished, click the Map tab on the ribbon. In the Navigate group, click Bookmarks and click Campgrounds. On the Quick Access Toolbar, click the Save button to save the project. A visual inspection is helpful, but a better way to find out which buffers contain Nassella tussock is to use a geoprocessing tool. 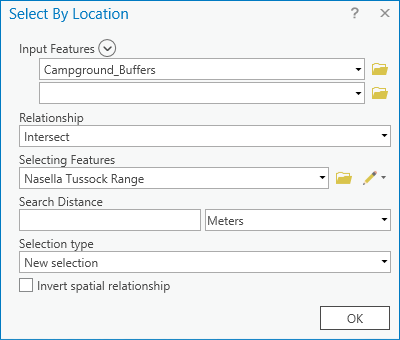 You want a tool that finds features in one layer (Campground_Buffers) according to whether they have area in common with features in another layer (Nassella Tussock Range). You can search for tools with keywords. In this case, keywords such as contain, inside, or within might help you. In the Geoprocessing pane, click the Back button . At the top of the pane, in the search box, type contain. Several results are returned. By default, each tool is displayed as a tile with a short description. If your results are displayed as a list instead, click the Tiles button at the bottom of the Geoprocessing pane. Scroll through the results and locate the Select Layer By Location tool. The tool selects features according to their spatial relationship to other features. This sounds like what you want. If you don't see the tool in the search results, type the tool name into the search box instead. You can also click Select By Location in the Selection group on the Map tab. The tool is accessible from the Map tab because spatial selection is a common map exploration technique. In the Geoprocessing pane, click Select Layer By Location to open the tool. On the tool, click the Help button to open its help topic. In the help topic, the Summary and Usage sections give general information about the tool. The Syntax section describes its parameters. See Anatomy of a tool reference page to learn more about the organization of geoprocessing tool help topics. A key parameter for this tool is the spatial relationship to be evaluated. Depending on the situation, you may want to know whether features intersect, contain, touch, or lie within a certain distance of other features. In this situation, containment might seem to be the right relationship: you want to find campground buffers that contain Nassella tussock. However, this choice is too restrictive. Imagine a patch of Nassella tussock that lies partly inside and partly outside a buffer. This patch is relevant to your analysis, but the buffer does not contain it: it only intersects it. On the other hand, if a patch lies entirely inside a buffer, the buffer both contains and intersects it. Therefore, you should use the intersect relationship. This buffer contains only one of the two features but intersects both. Intersection includes partial and complete overlap. For illustrations of how spatial relationships are defined with respect to different feature types (points, lines, and polygons), see Select By Location: graphic examples. On the Select Layer By Location tool, click the Input Features drop-down list and click Campground_Buffers. Confirm that the Relationship is set to Intersect. Click the Selecting Features drop-down list and click Nassella Tussock Range. The features in the input feature layer are the ones that will be selected. You want to see which campground buffers are intersected by grass, not which patches of grass are intersected by campground buffers. There is no output feature class parameter because the Select Layer By Location tool does not create a new dataset—it makes a selection on the input feature layer. Four buffers are selected on the map. The number is confirmed by the message in the lower right corner of the map view. 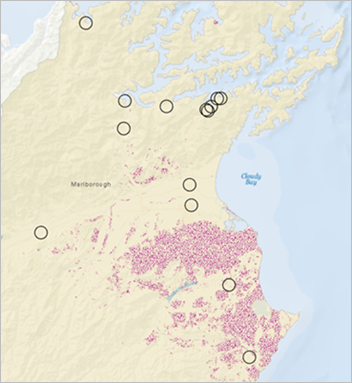 Two of the selected buffers are in areas where Nassella tussock is prevalent and two are not. This raises the question whether the four selected buffers have a geographic relationship that sets them apart from the others. In the Contents pane, turn on the Roads layer and expand it. The four selected buffers are linked by principal highways. This suggests that the road network facilitates the spread of Nassella tussock. On the other hand, many unselected buffers are also linked by highways. It would be useful to know which campgrounds are visited most often and whether vacationers typically visit multiple campgrounds, but these questions are beyond the scope of this tutorial. Turn off the Roads layer and turn on the Populated Places layer. Three of the four selected buffers intersect populated places. At the same time, many populated places have no Nassella tussock near them. While this brief investigation was inconclusive, spatial selections are a good way to discover patterns in your data and stimulate ideas for further analysis. Turn off the Populated Places layer. On the Quick Access Toolbar, click the Save button . Finally, you want to find out how much Nassella tussock lies within the selected buffers. This information can be shared with campgrounds and may help prioritize treatment. The measurements can also serve as a baseline for comparison in coming years. The tool you'll use is Summarize Within. You'll open this tool from the Analysis gallery. The Analysis gallery is a convenient place to access frequently used analysis tools. On the ribbon, click the Analysis tab. In the Tools group, expand the Analysis gallery. Under Summarize Data, hover over the Summarize Within tool and read its description. One of the functions of this tool is to calculate how much area in polygons from one layer falls within polygons from another layer. This is what you want to do. You can customize the Analysis gallery. 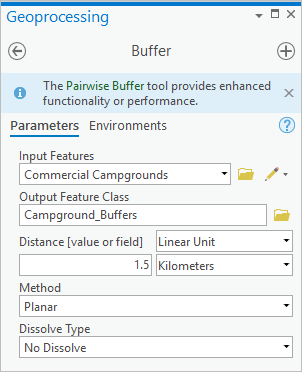 In the Analysis gallery, click Summarize Within to open the tool in the Geoprocessing pane. Click the Input Polygons drop-down list and click Campground_Buffers. When there is a selection on the input layer, geoprocessing tools work on the selected features only. In this case, only the four selected campground buffers will be processed and written to the output feature class. Click the Input Summary Features drop-down list and click Nassella Tussock Range. For Output Feature Class, change the name to Tussock_Within_Buffers. Like the Buffer tool, the Summarize Within tool creates a feature class. The output features will have the same shapes as the input features. The only difference will be in the attribute table. Click the Shape Unit drop-down list and click Hectares. A hectare is a metric unit of area equal to 10,000 square meters or roughly two and a half acres. When the tool completes successfully, the Tussock_Within_Buffers feature class is created in your project geodatabase and a layer is added to your map. On the ribbon, click the Map tab. In the Selection group, click Clear . In the Contents pane, turn off the Campground_Buffers layer. The Tussock_Within_Buffers layer has four features, corresponding to the four selected campground buffers. You'll change the symbol for the layer so you can see through it. In the Contents pane, click the symbol for the Tussock_Within_Buffers layer. In the Symbology pane, click the Gallery tab if necessary. In the search box, type extent transparent and press Enter. 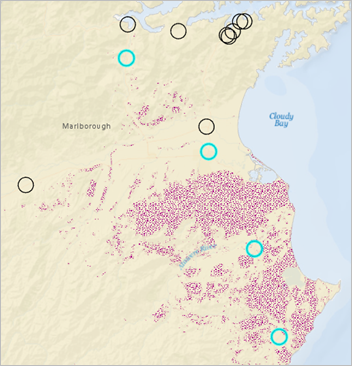 In the ArcGIS 2D style, several symbols are found with different colors and outlines. Click the Extent Transparent symbol to select it. In the Contents pane, right-click the Tussock_Within_Buffers layer and click Attribute Table . In the table, right-click the BUFF_DIST field heading and click Hide Fields(s) . Hide the ORIG_FID, Shape_Length, and Shape_Area fields also. The Summarized area in HECTARES field shows the analysis results. Remember that the Nassella Tussock Range layer represents areas within which the plant has been found, not the actual plant density. To display hidden fields, click the Menu button on the table view and click Show All Fields. In this study, you have a small number of samples and it's easy to compare them in the attribute table. However, with more samples, charts are a better tool for comparisons. You'll create a bar chart of the analysis results. In the Contents pane, right-click the Tussock_Within_Buffers layer. Click Create Chart and click Bar Chart . The Chart Properties pane appears and a chart view appears as well. The view is empty until you configure the Chart Properties pane. At the top of the Chart Properties pane, confirm that the Data tab is selected. Click the Category or Date drop-down arrow and click Name. In the chart view, the campground names appear on the chart's x-axis. At the moment, the chart displays the number of names per campground (which is 1). You need to choose the correct field to chart. In the Chart Properties pane, under Series, confirm that the option From one or more fields is selected. You are showing only one value in the chart, the Nassella Tussock value for each campground, so you can ignore the graphic options for displaying multiple series. 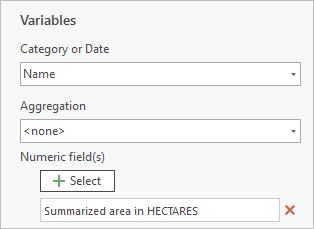 Under the Fields heading, click the drop-down arrow next to the Count(Name) field and click Summarized area in HECTARES. 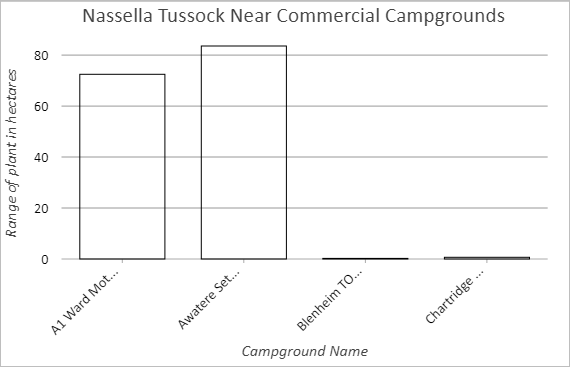 The chart's y-axis and data bars update to show the area covered by Nassella tussock near each campground. At the top of the Chart Properties pane, click the General tab. In the Chart title box, replace the current title with Nassella Tussock Near Commercial Campgrounds and press Enter. The title is updated on the chart. In the X axis title box, replace the current title with Campground Name and press Enter. In the Y axis title box, replace the current title with Range of Plant in Hectares and press Enter. If necessary, maximize the ArcGIS Pro window or undock the chart view and resize it to get a better look at the chart. The campground names may be cut off because of their length. You can avoid this by editing the names in the attribute table. Data values are labeled on the y-axis. The number of values depends on the size of the chart. In the Chart Properties pane, click the Data tab. At the bottom of the pane, under Data Labels, check the Label bars box. The bars are labeled with their exact values. To access the chart later, in the Contents pane, expand the Tussock_Within_Buffers layer. Under Charts, right-click the chart and click Open. Close any open panes other than the Contents and Catalog panes. ArcGIS Pro saves a record of the geoprocessing tools you have used in the project. This geoprocessing history shows the order in which tools were run and saves the tool parameter settings. The geoprocessing history can help you retrace your steps, run tools with different settings to explore alternative outcomes, and alter the workflow. You can also use the history to help build a geoprocessing model or to create a geoprocessing package of tools and data to share with others. In the Catalog pane, click the History tab. Under the History tab, click the Geoprocessing tab if necessary. The Catalog pane shows the geoprocessing tools you have run. They appear with green check marks because they ran successfully. On the History tab, right-click the Buffer tool and click View Details. A message window shows the parameter settings and other information. You can also right-click the tool to open it or to run it again with the same parameters. Different analysis tools can sometimes be used to achieve the same results. In this case, it wasn't strictly necessary to use Select Layer By Location. You could have run Summarize Within directly on the campground buffers. (Your output feature class would have had fourteen records instead of four. Ten records would have had values of 0 in the Summarized area in HECTARES field.) One advantage of the Select Layer By Location tool is that it provides visual feedback that can reveal spatial patterns and suggest new directions for your analysis. To go a step further, you could have replaced the Buffer and Summarize Within tools with Summarize Nearby, which combines the functionality of those two tools. Ultimately, this means you could have obtained your analysis results using one tool instead of three. However, you might have had a less clear understanding of the logical stages of the analysis. To see how the workflow in this tutorial can be modeled and run as a geoprocessing tool, try the Make a geoprocessing model tutorial. For more advanced case studies that involve understanding and comparing places, see How many streetlights and miles of bike route in each district? and Are liquor stores too close to schools, libraries, and parks? in the Applied Analysis section of the ArcGIS Desktop site.